The Beach at Palms Pelican Cove has a vibrant fringing reef that provides excellent snorkeling opportunities. When the water is rough, there is a bit of a rip current to be mindful of but the channel is well marked. It’s also an active sea turtle nesting beach. Bonus – the beach bar at the hotel is just a few steps away! The Blue Flag is an environmental award given to beaches and marinas making a special effort to implement sound management with respect to the local environment and nature, and providing users with information on environmental issues. To attain the Blue Flag, beaches and marinas have to comply with a number of strict criteria concerning environmental information and education, environmental management, safety and service facilities, and water quality. 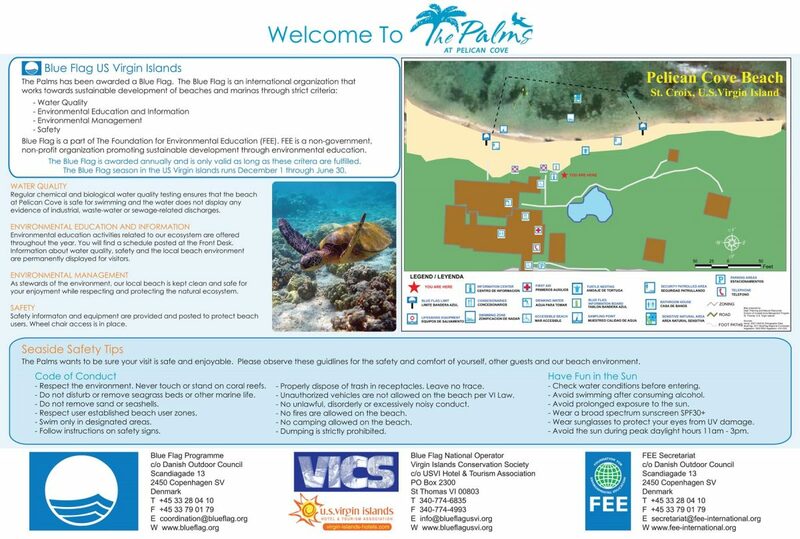 The beach at the Palms at Pelican Cove attained Blue Flag status in December of 2011. I was excited to be a part of this great project, designing the educational signs on the beach to compliment the large Beach Information sign I had designed several years back. The Palms have been excellent stewards of their beach and the environment for many years and I’m so happy for them to be recognized for their efforts.